Day 8 was a long travel day. The cool, rainy weather from Cape Town seems to have caught up with us in Knysna for the drive to Port Elizabeth. It was only about 14C but when we landed in Durban after an hour flight it was a much warmer 25C. 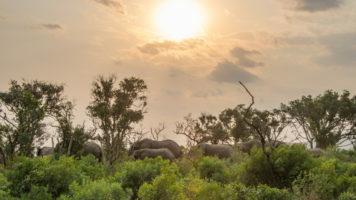 From there, we drove to Thula Thula, the game reserve featured in The Elephant Whisperer. After reading the book, I made sure a stop here was included. As we pulled up at the gate, the sun was setting so we hopped out to capture it. The round homes are very typical in Zulu villages like this one. After checking in, we made our way to our cabins and spotted our first giraffe – and then a few more! In the morning, we did a game drive to try and find the famous herd of elephants. After about an hour of searching, we started to lose hope. Luckily another guide spotted them and radioed us with their location. 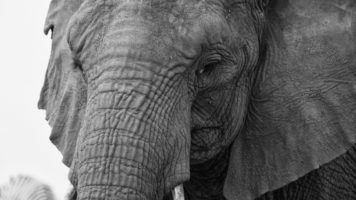 Our ranger and tracker knew all the elephants by name and it was a treat to see Nana and Frankie – the old and the new matriarchs – and all the others. This was definitely a highlight of this trip! After breakfast, we made our way to St Lucia on the coast of the Indian Ocean and home to the largest estuary in South Africa. We had an evening boat cruise and saw many, many hippos and even a few crocs. A pretty fantastic way to end the day!